EVERYTHING ENDS: Enormity Part Three closes a door and opens many others. The release of the third and final instalment of Enormity closes a chapter in my life, but also opens many others. The completion of the book sees me arrive at a destination I dreamed of since primary school: the world of a published author. While in its earliest stages, the process of the book’s rise in popularity is underway and the positive response gives me the confidence to aim very high. There are many years of marketing and promotion ahead, but it is a challenge that can only bring further success. In my eyes Enormity is now impervious to failure. I’ll recount this anecdote in more detail on Meadowlake Street in the future, but one afternoon I was sitting in a Circular Quay hotel room chatting to Nick Littlemore and Luke Steele. They were about to release the debut album of their new project Empire of the Sun. I mentioned to Littlemore that I was writing a novel. If my memory serves me correctly, he revealed he had a similar aspiration. But Littlemore gave me a very direct and simple piece of advice: “Just finish it.” He went on to advise that it did not matter whether I released it – or even told anyone about it. The act of simply finishing a novel from start to finish – something which so many aspiring writers might never achieve – would be the clearance of the biggest hurdle I would ever face as an author. To “just finish” a book would begin my life as a writer. Nothing could happen until I had experienced the entire process and endured it until an end point. It is simple advice that is easier said than done. But I never forgot it. 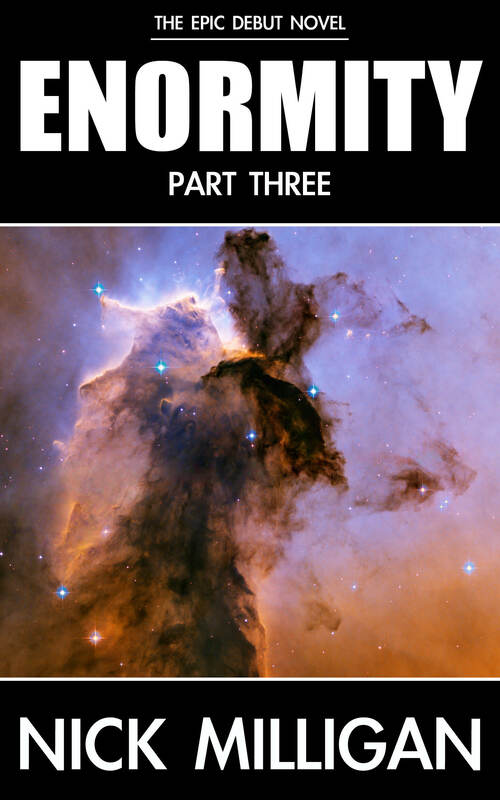 I was nervous ahead of the release of Part Three of Enormity. It is undoubtedly the darkest section of the book and arguably the most confronting. It is the weirdest. The most abstract. Part Three is reliant on Part One and Part Two to draw the reader into this planet and to relax into a suspension of disbelief. Or an embracement of belief? The final chapter harbours the biggest twist in the book. I hoped it would hit the reader like a haymaker. A colossal king-hit. Only time will tell if this is its impact. But, so far, the response has been positive. Releasing a book is like putting a child into the world. I am responsible for its creation but now powerless to control its public reception. It is apparent from explaining the release of Enormity to my friends and acquaintances that the majority of Australians have not joined the eBook revolution. This is quickly changing and I suppose authors like myself are championing the technology and encouraging Aussies to read their first eBook. But the confused reaction from many of my social media friends suggests that I need to focus on the American and UK markets if I am to sell larger quantities of the book. Australia will catch up. It’s exciting to think that I am attempting to penetrate a worldwide market that is expanding exponentially. The ease in which you can download and read books, without venturing to a brick and mortar store, will see an increase in readers and a greater likelihood of building a global fan base. I will post continued updates on this blog. FUTURE PROJECTS? : Keep your eyes peeled for a collection of short stories and a second novel. This week a penny dropped for my second book and work may start in the next month.